Enhance your treatments and services with these fabulous heat packs. 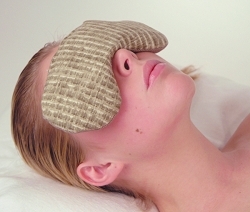 The warm, comfortable texture will soothe and relax the muscles with this pampering therapeutic treat. The packs contain all natural ingredients and emit analgesic, hot moisture, which is the preferred method of relieving sore muscles. Heat in the microwave. 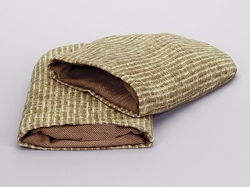 Durable fabric with soft khaki tone, stuffed with flax seeds. Large pack that is great for arthritis, shoulder pain and stress relief. Weight: 3 lbs. Size: 17" at widest point. The unique shape of this neck wrap allows it to stay in place. Fits to warm the neck and decollete. Weight: 3 lbs. This pack generously covers the torso for total body warmth. Size: 22" x 15". Weight: 7 lbs. Contains lavender for a gentle aroma to soothe tired eyes. Great for hand treatments, arthritis and joint problems. Facilitates the absorption of hand care products. Hands become warm and relaxed. Includes 2 mitts. 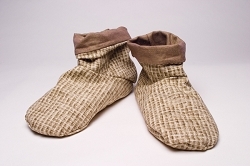 Tired feet will appreciate these relaxing herbal booties. Special herbs reduce swelling and muscle pain. Regular size fits up to a woman's size 10 shoe; Extra Large size fits up to a men's size 12-13.